“I will arise and go now, and go to Innnisfree”. These are the openings words written by the Irish poet W.B. Yeats in hectic and bustling London. 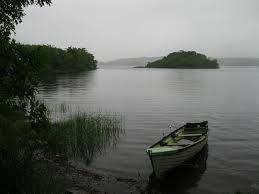 The poet expresses his wish to leave for Innisfree, a small island in Lough Gill near Sligo in the north of Ireland. Dennis recited the poem on Justin and Patrick’s last visit a few weeks ago and its opening line has been placed on the cover page of the order of service. It is as though Dennis is saying to us, “I will arise and go now”. He has left us, he has departed. He will arise out of the limitations of this world, from the cancer which had dogged him for so long, out of ignorance into knowledge, out of pain into beatific vision. He has not gone into the dark or into annihilation. He is free. It is we who live confined by time and space and doubt. Some would say that Dennis cannot “arise and go now” because they think he exists no more. The unwise would say that he is trapped in his mortality and locked into death. This was certainly not the way he felt. In his last days he quoted St Paul literally and said “Death where is thy sting”. Dennis knew something about death. The military medals displayed near his coffin show that he had known it at close quarters as a young man in the Middle East and in the Pacific. He knew that death did not count, it was an empty thing; it had no sting. He had also fought the good fight. He had shown courage both in battle and in the wounds he received. He had fought the good fight of everyday life. He kept the faith: faithful to his comrades in arms, faithful to his wife, his children and grandchildren, he kept faith with his God. He will go now to his Father because of Jesus who says to his disciples: “If you loved me you would rejoice because I go to the Father”. We love Dennis and we rejoice that he has now gone to the One in whom he placed his ultimate faith. He has crossed, not the waters of Lough Gill but the waters of death. Today we celebrate his great journey to the eternal isle where all is peace. Dennis is arising and going to Innisfree. Already in his garden at home, as he fed the birds, he could hear the deep sound, “in the deep heart’s core”, as the poem says. Those who are deafened by the shouts of desire cannot hear the “lake water lapping”, but Dennis had the sensitivity of the Spirit who gave him ears to hear the Word which God whispers tirelessly within us. This is the Christian conviction: that those who have lived in God will be free. As St Paul says: “I will tell you a mystery: “perishable nature will put on the imperishable, mortal nature will put on immortality”. Dennis is being refashioned and restored. He beckons to us from across the waters, inviting us to join him in the blessed isle. May we follow where he has led.